Rutherfordine: Mineral information, data and localities. Named by W. Marckwald in 1906 in honor of Ernest Rutherford (30 August 1871, Brightwater, New Zealand - 19 October 1937, Cambridge, England, United Kingdom), atomic physicist. 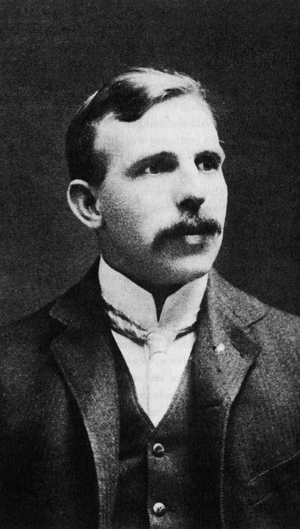 He made tremedous discoveries in nuclear physics including discovering the concept of radioactive half-life, proving that radioactivity involves the transmutation of one element into another, differentiating and naming alpha and beta radiation, discovering and naming the proton, and developing the Rutherford model of the atom (i.e. an atom with a small nucleus). He was awarded the Nobel Prize in Chemistry in 1908 and the element rutherfordium is named in his honor. 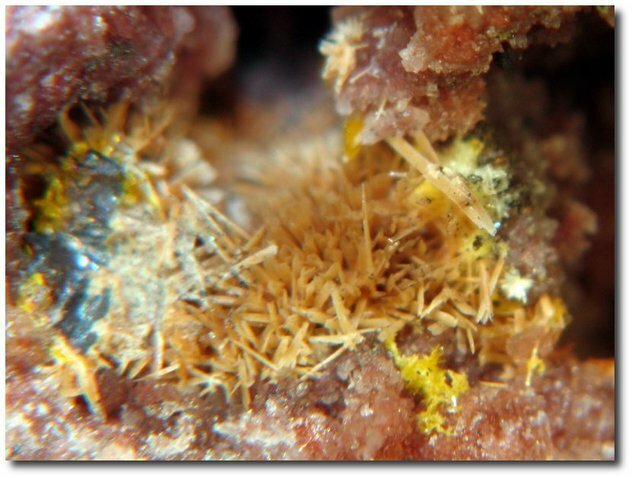 This page provides mineralogical data about Rutherfordine. 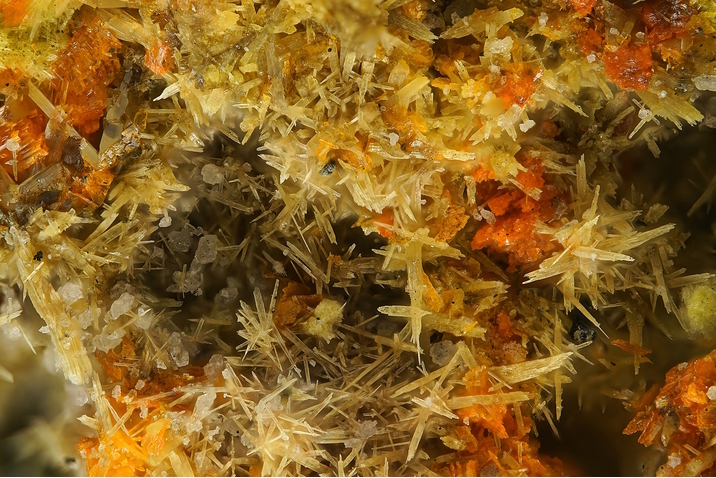 Pulverulent masses composed of minute matted fibers, pseudomorphic after uraninite. Schoepite 16 photos of Rutherfordine associated with Schoepite on mindat.org. Uranophane 15 photos of Rutherfordine associated with Uranophane on mindat.org. Wölsendorfite 9 photos of Rutherfordine associated with Wölsendorfite on mindat.org. Uraninite 8 photos of Rutherfordine associated with Uraninite on mindat.org. Malachite 5 photos of Rutherfordine associated with Malachite on mindat.org. Billietite 5 photos of Rutherfordine associated with Billietite on mindat.org. Soddyite 4 photos of Rutherfordine associated with Soddyite on mindat.org. Becquerelite 3 photos of Rutherfordine associated with Becquerelite on mindat.org. Studtite 3 photos of Rutherfordine associated with Studtite on mindat.org. Cuprosklodowskite 2 photos of Rutherfordine associated with Cuprosklodowskite on mindat.org. 5.EB.10 Blatonite (UO2)CO3 · H2O Hex. 5.EB.15 Joliotite (UO2)CO3 · nH2O Orth. 5.EB.20 Bijvoetite-(Y) Y8(UO2)16(CO3)16O8(OH)8 · 39H2O Mon. 11.11.3 Joliotite (UO2)CO3 · nH2O Orth. 11.11.4 Grimselite K3Na(UO2)(CO3)3 · H2O Hex. 11.11.5 Bayleyite Mg2(UO2)(CO3)3 · 18H2O Mon. 11.11.6 Metazellerite Ca(UO2)(CO3)2 · 3H2O Orth. 11.11.7 Zellerite Ca(UO2)(CO3)2 · 5H2O Orth. 11.11.8 Wyartite CaU5+(UO2)2(CO3)O4(OH) · 7H2O Orth. 11.11.9 Urancalcarite Ca(UO2)3(CO3)(OH)6 · 3H2O Orth. 11.11.11 Voglite Ca2Cu(UO2)(CO3)4 · 6H2O Mon. 11.11.14 Rabbittite Ca3Mg3(UO2)2(CO3)6(OH)4 · 18H2O Mon. 11.11.17 Astrocyanite-(Ce) Cu2(Ce,Nd,La)2(UO2)(CO3)5(OH)2 · 1.5H2O Hex. 11.11.18 Bijvoetite-(Y) Y8(UO2)16(CO3)16O8(OH)8 · 39H2O Mon. 11.11.20 Znucalite Zn12Ca(UO2)(CO3)3(OH)22 · 4H2O Orth. Larsen, E.S. (1921) The Microscopic Determination of the Nonopaque Minerals, First edition, USGS Bulletin 679: 129. Palache, C., Berman, H., Frondel, C. (1951) The System of Mineralogy of James Dwight Dana and Edward Salisbury Dana, Yale University 1837-1892, Volume II: Halides, Nitrates, Borates, Carbonates, Sulfates, Phosphates, Arsenates, Tungstates, Molybdates, Etc. John Wiley and Sons, Inc., New York, 7th edition, revised and enlarged: 274-275. Frondel, C., Meyrowitz, R. (1956) Studies of uranium minerals (XIX): rutherfordine, diderichite, and clarkeite. American Mineralogist: 41: 127-133.
International Mineralogical Association (1980) International Mineralogical Association: Commission on new minerals and mineral names. Mineralogical Magazine: 43: 1053-1055. Finch, R.J., Cooper, M., Hawthorne, F.C., Ewing, R.C. (1999) Refinement of the crystal structure of rutherfordine. Canadian Mineralogist 37: 929-938. Kubatko, K.-A., Helean, K., Navrotsky, A., Burns, P.C. (2005) Thermodynamics of uranyl minerals: Enthalpies of formation of rutherfordine, UO2CO3, andersonite, Na2CaUO2(CO3)3(H2O)5, and grimselite, K3NaUO2(CO3)3H2O: American Mineralogist: 90: 1284-1290. Bonales, L. J., Colmenero, F., Cobos, J., & Timón, V. (2016). Spectroscopic Raman characterization of rutherfordine: a combined DFT and experimental study. Physical Chemistry Chemical Physics, 18(24), 16575-16584. Sejkora, J., Čejka, J., Bureš, B.: Nález vzácného karbonátu uranylu (rutherfordinu) v jáchymovském rudním revíru. Bulletin mineralogicko-petrografického oddělení Národního muzea v Praze, 2004, roč. 12, s. 163-166. El-Naby, H. H. A. (2009). Role of geochemical alteration on the formation of secondary Zr-and U-bearing minerals in El Atshan trachyte, central Eastern Desert, Egypt. Journal of Mineralogical and Petrological Sciences, 104(1), 37-51. [Le Règne Minéral 1997, 13, p.5-18]; Bariand, P., Bachet, B., Brassy, C., Medenbach, O., Deliens, M., Vautier, R., & Piret, P. (1993) A New Uranium Mineral from the Talmessi Mine, Iran, and Rabejac, France. Mineralogical Record: 24: 463-467; Dal Bo, F., Hatert, F., & Philippo, S. (2018). Supergene Uranyl Mineralization of the Rabejac Deposit, Lodève, France. Minerals, 8(9), 414. 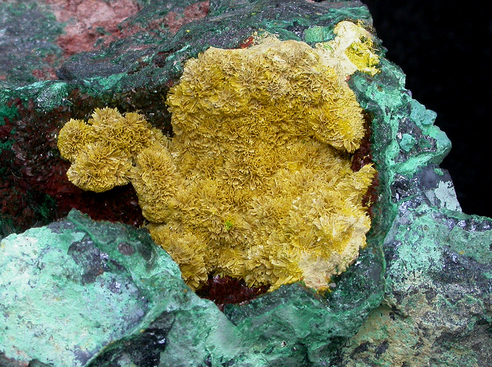 Wittern: "Mineralfundorte in Deutschland", 2001; Schmeltzer, H. (1993): Die Grube Segen Gottes bei Schnellingen - ein polymetallisches Mineralvorkommen. Der Erzgräber, 7 (2), 34-35.
ⓘ Val Daone Mine (Val Daone uranium prospects) ? Bowell, R. J., & Davies, A. A. (2017). Assessment of supergene uranium-vanadium anomalies, Meob Bay deposit, Namibia. Geochemistry: Exploration, Environment, Analysis, 17(2), 101-112. Neumann, H. (1985): Norges Mineraler. Norges Geologiske Undersøkelse Skrifter 68, p. 103. USGS (2005), Mineral Resources Data System (MRDS): U.S. Geological Survey, Reston, Virginia, loc. file ID #10037219. Rocks & Min. 80:256 (2005); Korzeb, Stanley L., Foord, Eugene E., and Lichte, Frederick E. (1997) The chemical evolution and paragenesis of uranium minerals from the Ruggles and Palermo granitic pegmatites, New Hampshire. Canadian Mineralogist, 35, 135-144. Handbook of Mineralogy - Anthony, Bideaux, Bladh, Nichols; Page, L. R.; Stocking, H. E.; Smith, H. B. (1956) Contributions to the geology of uranium and thorium by the United States Geological Survey and Atomic Energy Commission for the United Nations International Conference on Peaceful Uses of Atomic Energy, Geneva, Switzerland, 1955. USGS Professional Paper 300 pp361-370.